Taxes and your rental property! What to report and deduct! Due to the slow pace of the sales market, some homeowners have decided to lease their properties until the market picks up! In most cases this is a smart move! Instead of letting your property sit vacant and lose money every month, homeowners cut their losses and lease it to somoneone willing to pay their mortgate (or part of their mortgage in some cases). I get lots of questions from new “investors” about the tax benefits on rental properties. While the IRS has thousands of pages on the subject, I’ll briefly break down what you need to know as you consider renting your property out! 1. What income do I have to report? You’ll have to report all rents collected during a specific calendar year. 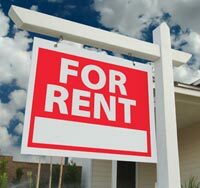 Rent does not include the security deposit, UNLESS you keep part of it when your tenant vacates. If your tenant pays rent in advance and it covers the next year, you’ll still have to report what you receive in the year that you receive it. You are also require to report any utilities that your tenant pays as rental income. 2. What can I deduct on my taxes that are related to my rental property? Finally, if you own a percentage of the rental property, you can only deduct the percentage of what you own. Do you have any questions? Do you have any additional expenses that you have been able to deduct for your rental property?